Paul Beaver is to be commended for writing a concise story of the remarkable development of the Spitfire. As with engineering it is far harder to make something that is as minimal as possible rather than something which is bloated or over done. I can also understand the complexities of explaining the labyrinths of Spitfire marks and their chronology, see our guide by clicking here. The artwork and technical plans by Jon Freeman also bring this story to life and illustrate how this aircraft was revised technically to meet the challenges of opponents and the rigours of naval use. 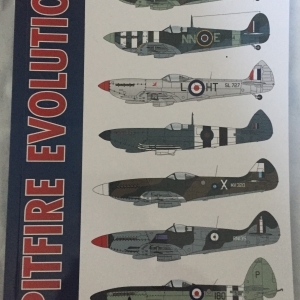 I can thoroughly recommend this addition to the cannon of Spitfire literature as a concise and insightful guide to the Spitfire's evolutionary process.